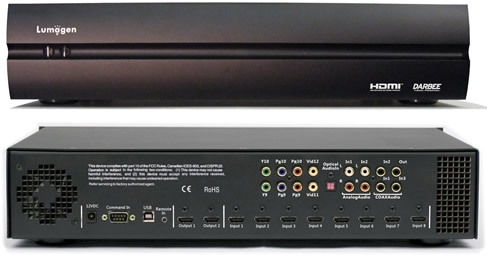 The Radiance 21xx series all have eight HDMI inputs and two HDMI outputs They use an external 12 VDC power supply and have one RS232 control/update port as well as a USB control and update port. The 2123 is in a 1U high case and has an option of rack ears. The 2124 is in the larger 2u high form factor case and has additional analogue video and audio inputs as well as a co-ax audio output for legacy devices. As these new units have bigger memory and processing power compared to the previous range you can expect that over time they will get increased performance and functionality. Currently Lumagen are working on bringing out a 17x17x17 3DLUT CMS capability to these devices. The Radiance range are plug and play out the box but due to their very powerful feature set and on board calibration tools we advise that you consider having the unit professional installed at the same time as having a full video calibration done of your system. This 17x17x17 look up table capability is a magnitude greater than previous Lumagen products and even they were hugely more accurate than the tools built in to any domestic tv or projection system. Radiance 2123 and Radiance 2124 are both ideally suited for use in systems with 2.35:1 projection screens either with or without anamorphic lens. Their powerful scaling engine uses Lumagens own proprietary no ring scaling algorithm which is regarded as being the highest quality possible and is not available in any non Lumagen product. We will not be beaten on price internationally please contact us for international pricing.